If you’ve ever watched a courtroom drama on TV or followed a real-life televised court case, then you’ve probably seen court reporters in action. 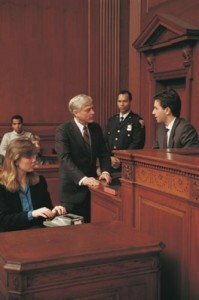 Look carefully in the background of any of these busy legal settings, and you’ll see the ever-present court reporter, silently and efficiently making a legal record of the court case. Court reporters — sometimes called legal transcriptionists — work in any legal setting where an accurate, word-for-word record of what is being said is needed. They can work on site in courtrooms, in state and federal legislatures, during legal depositions and even at public speaking events. They can also work from home providing closed captioning for deaf and hard-of-hearing viewers of television broadcasts. It may sound simple enough to make a record of what is being said around you, but the job of a court reporter is anything but simple. The reporter must record every word that is spoken and also make notes about every gesture and action they see. The reporter is also responsible for the correct spelling of any names that come up during a proceeding as well as any medical or technical terms. Transcripts must be reviewed carefully for typographical errors before submission. Court reporters must gain proficiency in the use of at least one of a variety of recording tools. They may have to use a stenotype machine, which is like a keyboard but uses combinations of letters to allow conversations to be transcribed with great speed. The reporter might also have to use a steno mask, speaking into its covered microphone to record both the dialog and the actions and gestures at a proceeding. Court reporters can also make digital recordings, but must still turn those recordings into a legal record with accurate spellings and notes. Manual dexterity, focus and a high level attention to detail are required to successfully use any of these tools. If you would like to work in the legal world or would like to help people with hearing problems then becoming a court reporter is a good career choice. Here are the steps you will need to take. Once you have your high school diploma or GED, you will want to look for a community college, technical school or online university that offers a postsecondary certificate program designed to train court reporters. Usually you must choose between different programs based on the type of recording device you want to master. If you choose a program that trains students in the use of digital recording or a steno mask, your course work will probably run for about six months. If you decide to master the use of a stenotype machine, then you will be in school longer. Mastering this complex technique can take two to four years. However, in the course of your studies, you will be able to earn an Associate of Art’s Degree. You will also be expected to take classes in English grammar, phonetics and legal terminology. After you have completed your training and earned your certificate, in most states you will still need to be licensed before you start to work. Licensing varies depending upon the type of recording method you have been trained to use. The National Court Reporter Association website offers certification for both court reporters and broadcast captioners. To become a Registered Professional Reporter you must pass a written test and also prove that you can type at least 225 words per minute. Court reporters can be proud of the important work they do and can earn, according to the Bureau of Labor Statistics (BLS), an average of $47,000 a year.